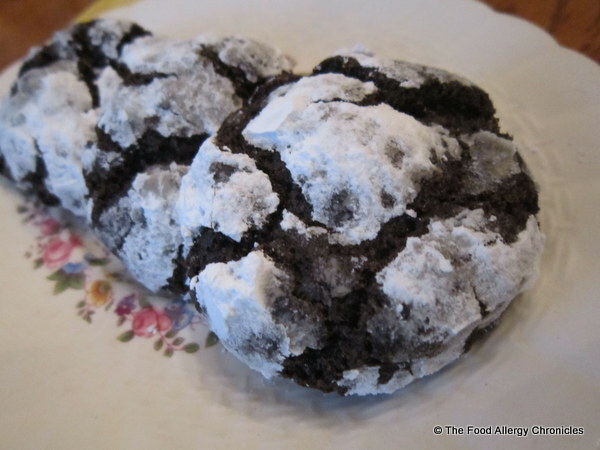 Posted on November 5, 2012 by Susan H.
I was inspired to bake up a batch of Dairy, Egg, Soy and Peanut/Tree Nut Free Chocolate Crinkle Cookies by my Secret Sister. Carla @ My 1/2 Dozen Daily’s Secret Sister Swap, hosted the event. 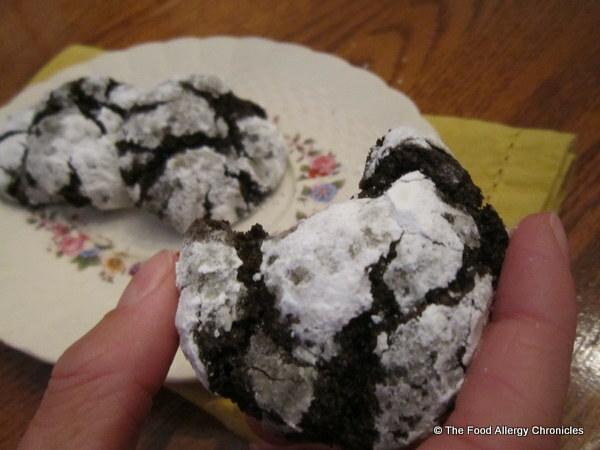 Chocolate Crinkle Cookies are one of my Secret Sister’s favourite cookies to bake at Christmas time…therefore, I thought it would be fun to bake an adapted version. A win/win situation…my boys are able to try out a new cookie and my Secret Sister will receive a sweet treat in the mail! before tossing them in icing sugar and baking them. Perfect for the times when one craves a freshly baked cookie! The only necessary adaption was the 2 eggs…I replaced them with 2 tbsp of water and 1/4 cup of prune puree added to the wet ingredients and an extra 1/2 tsp of baking soda to the dry ingredients. I always believe that a recipe is only as good as the ingredients one uses…therefore, I made sure to use real cacao powder…Mum’s Original Organic Criollo Arriba Cacao Powder and Wholesome Sweeteners Organic Sugar. Click here for Kate’s yummy recipe. P.S. Unfortunately, in my rush to get my Secret Sister’s package off in the mail…I ended up deleting all the pictures I took of the items in her package. I am hoping she will be posting her gifts I sent on her blog, at which point I will attach a link. P.P.S. I want to thank Tara @ Sew Tara for her DIY section on her blog. It was my inspiration for one of the gifts for my Secret Sister…a Tomato Pin Cushion Revamp! P.P.P.S. I also want to give a shout out to my neighbour, Joanna @ That Thing I Made. She had the perfect material for the revamp…with a few colorfully topped pins…I was really pleased with the outcome, considering I am not much of a sewer! Joanna also threw in some awesome bamboo handles which inspired me to search for a sewing pattern for a bag and some funky 70’s material. This entry was posted in baking, cookies, dairy free, egg free, multiple food allergies, peanut/tree nut free, soy free and tagged Dairy Egg Soy and Peanut/Tree Nut Free Chocolate Crinkle Cookies, Living The Frugal Life, Mum's Original Organice Cacao Powder, My 1/2 Dozen Daily's Secret Sister Swap, Sew Tara, That Thing I Made, Wholesome Sweeteners Organic Sugar by Susan H.. Bookmark the permalink. Susan – you are awesome!!!! I just sent you an e-mail. Thank you very much!!! You are very welcome! It was so much fun…I am glad you enjoyed the cookies! Oh these look sooo good!! Yum! Going to have to see what I can do about these!! 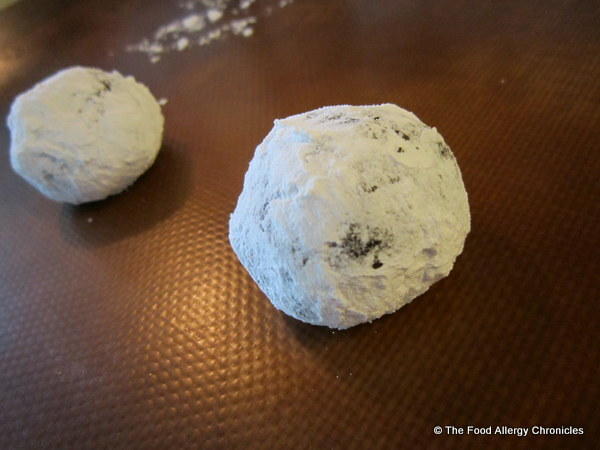 Just replace the flour with Namaste Perfect Flour Blend and use whatever oil is safe for you. You will be able to use the 2 eggs in the original recipe. Enjoy! I want to make the cookies too. And I have some Namaste flour thanks to you and Carla informing me 🙂 Now, if going egg free, can I cheat and buy baby prunes? (I’ve been experimenting with cooking mostly vegan). Excellent! 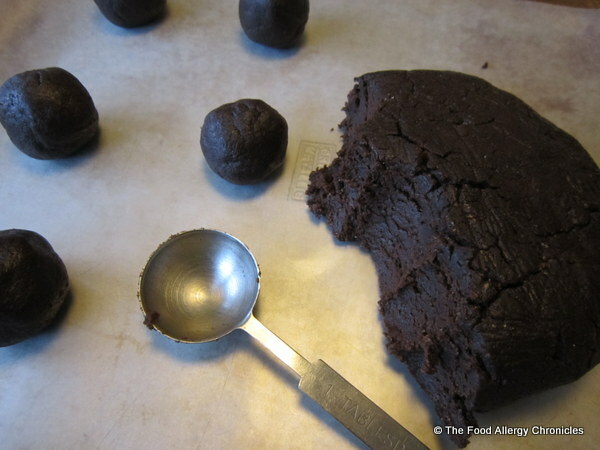 Yes, my adaption replaces the 2 eggs with 1/4 cup of prune puree, 2 tbsp of water and an extra 1/4 tsp of baking soda. It worked out great…let me know how they turn out using the Namaste Perfect Flour Blend! Enjoy! P.S. All my baking is dairy and egg free.